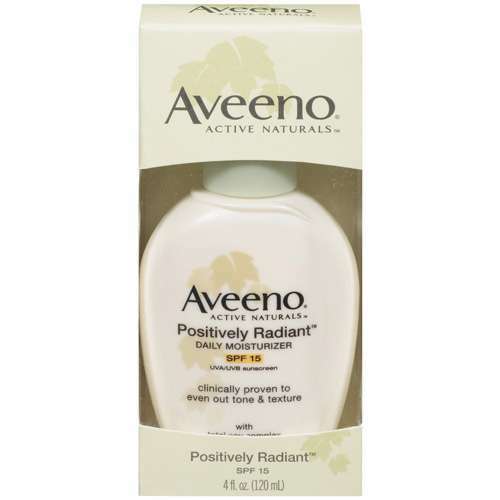 I started using Aveeno Positively Radiant Daily Moisturizer SPF 15 about five years ago, by just randomly picking it off a drug store shelf. At the time I was using Retin A, therefore was looking for a moisturizer that contained an SPF. And I’ve got to tell you, I have never purchased a moisturizing product that has worked as well as this one. Throughout the past five years I’ve tried various other brands, only to come back to Aveeno. It is light-weight, absorbs quickly, and has truly made a difference in the way my skin looks and feels. I believe much of that has to do with the ingredient of Soy. *Soy proteins work to reduce blotchiness and discoloration. Smoothes and softens skin texture. *Helps to reduce the appearance of fine lines and wrinkles. Reduces the appearance of unwanted hair. *Vitamin E is a natural component of Soy with anti-oxidant properties, which helps to protect the skin from environmental stresses like free radicals. With clinically proven Total Soy Complex and natural light diffusers, this daily moisturizer evens out skin tone and texture and immediately reflects light to bring out skin's natural radiance. Its fast-absorbing formula leaves skin soft and smooth and is clinically proven to improve skin tone and texture in as little as 4 weeks. Gentle enough for sensitive skin and daily use, this moisturizer is also oil free, hypoallergenic, noncomedogenic and contains SPF 15 UVA/UVB sunscreen. So, if you‘ve been looking for a great moisturizer, but haven’t had much luck, I can highly recommend Aveeno Positively Radiant Daily Moisturizer SPF 15. It also comes with an SPF 30. You can find this product at Aveeno, Target, or any drug store that sells Aveeno Products.